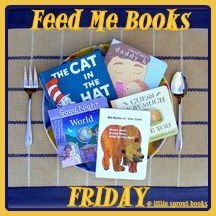 Time to Eat by Steve Jenkins and Robin Page is a nonfiction book covering a variety of animals and what they eat. It may not sound that exciting to the average reader to read short informational paragraphs about animals' dietary habits. When you throw in facts like a tick drinks the equivalent of a human drinking 6,000 milkshakes a day in blood or information like a shrew will die if it doesn't eat every 2 to 3 hours, curious minds can't resist this book. The is a good balance of trivial facts- a baby blue whale can gain up to 200 lbs a day - and gruesome details- the black widow spider paralyzes it's prey and eats it while still alive. This small picture book is packed with details and includes an appendix with even more details for older readers. This is part of a series of three books including Time to Sleep and Time for a Bath. We had to have at least one nonfiction book on our countdown of the Best Books of 2011. 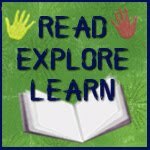 If you're looking for great nonfiction for ages preschool- third grade, this is a great series! Check out all of my boys' favorite books for 2011 on my Best of 2011 Pinterest board. And come back tomorrow for our TOP book of 2011! I hopped over from Read Explore Learn. I have not heard of the "Time..." book series. I will have to find them to read with my son. We are always looking for good book suggestions. This sounds like a wonderful series! I love finding new book recommendations! I also wanted to invite you to link up at TGIF Linky Party - http://livinglifeintentionally.blogspot.com/search/label/Linkey%20Parties. It's hard to go wrong with a Steve Jenkins book. They are always packed with details!